Caution: Do not put on the Gear VR when you are wearing glasses. Doing so may cause facial injuries. If you need corrective lenses, it is recommended that you wear contact lenses when using the Gear VR. If you are farsighted or there is a big difference between your left and right eyes’ vision, wear corrective lenses before using the Gear VR. 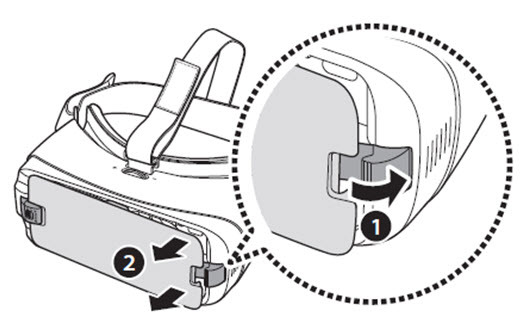 How do I install the Gear VR’s strap? 1. 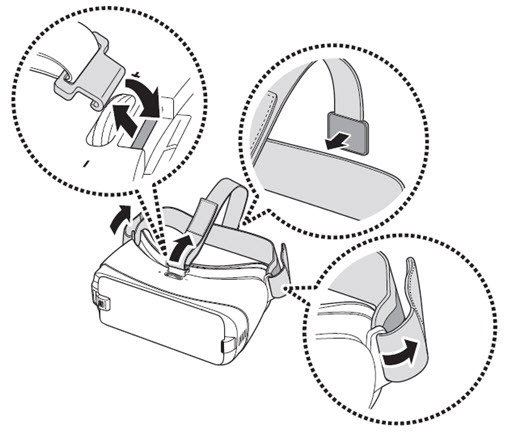 Insert the ends of the straps through the strap loops on the Gear VR and use the velcro to fasten each end. 2. Pull the device holder (right) to the right (1) then remove the front cover (2).